West Sonoma County—known to locals as West County—is the most delicious place in America. It's still something of a secret to the outside world, but I predict that will soon change as more people catch on. West County is America's Tuscany—a land of word-class wineries, cider houses, artisanal cheesemakers, heritage breed goat and cattle ranches, family-owned organic farms, wild mushrooms, fresh Dungeness crab, wild abalone, king salmon and, thankfully, an absence of pretense. Nowhere else in the country has as many great raw ingredients and food products in one place. That bounty has inspired generations of chefs, home cooks, foragers, fishermen, winemakers and brewers who celebrate West County's abundance. "In Sonoma's West County, we know that food quality and abundance are within arm's reach—we almost take it for granted," says Heidi Herrmann, seaweed harvester, farmer and agro-ecology instructor at Sonoma State University. "This little pocket of land on the left edge of the continent is a culinary wonder." In spite of all this great food, the region still flies under the radar. Back before I knew better, I filed West County under "Need to check that place out; seems cool." Before I relocated here in 2011, I'd pass through Sebastopol a couple times a year on weekend drives out to the Russian River to escape cold San Francisco summers or during a search for affordable housing, a game my wife and I used to play called "Should we move here? How about here?" Each time we drove through Sebastopol—the commercial if not spiritual heart of West County, I'd come to learn—and the surrounding vineyards, apple orchards and redwood forests, I'd inhale deeply. I slowed down. There was something about this place I couldn't quite identify, a rugged charm and bohemian spirit I found alluring. As a food writer, what really haunted my dreams was my unconfirmed belief that West County was an authentic source of great food and drink, raw ingredients and craftspeople that hadn't been spiffed up and reconstituted to appeal to a mass audience. It was the un-Napa, a land of milk and honey and exceptional Pinot Noir without the tourists and bachelorette party limos. That's what my foodie radar told me. But I knew my short forays there weren't enough to confirm my suspicions. And anyway, if West County was this culinary nirvana, why wasn't it already overrun with visitors and celebrity chef steakhouses? Food Forward, traveling in a 26-foot, refurbished 1966 Airstream trailer with my wife and two young children. As I put together the itinerary of farms, dairies, ranches and restaurants to visit, I knew I wanted to include a stop in West County to see once and for all what was up with that place. Long story short, we showed up and never left. It was the place I had been looking for. I've spent the years since exploring West County, turning down new roads to see where they go, pulling over at farm stands, eating at new and old restaurants and drinking my share of local wine, beer and cider. One of my first dining experiences in West County was at Lowell's in Sebastopol. I think it was over a bowl of their beans and greens for breakfast that I realized I was on to something good. Founder Lowell Sheldon—who went on to open Handline with partner Natalie Goble in 2016 and is building a third business called Fern Bar, a cocktail lounge and small-plates restaurant in Sebastopol due to open this fall—has long been a champion of West County as a culinary region with his rigorous local sourcing and commitment to sustainable agriculture. But he's not alone. Restaurants like Ramen Gaijin, Zazu, Farmhouse, Fork Roadhouse, Casino Bar and Grill, Hazel, Boon and others all raise West County's profile. To raise awareness of West County's community of like-minded businesses, Lowell Sheldon and his team have been at work on a map of the area's many splendid things for the past 18 months, and it's going to be available this week. It's a must have. 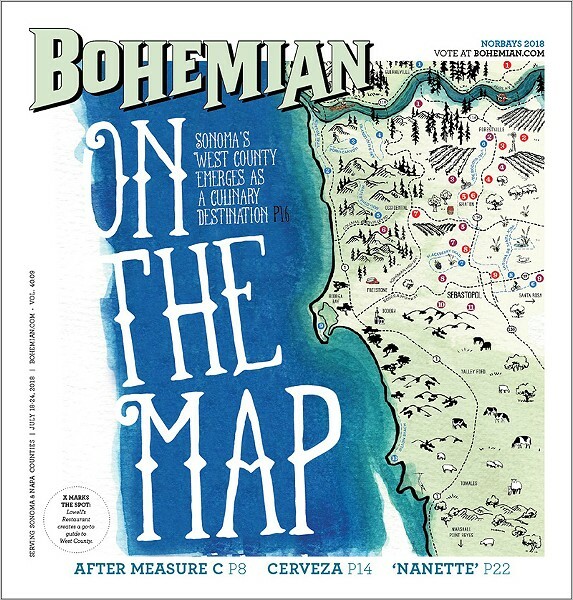 The "West Sonoma County Field Guide" is a piece of marketing, but it's more than that. It's the first document to draw a circle around the region and showcase its many delicious things. It puts West County and its unique business and destinations on the map by creating the map.